Are you ready to get your learning on about Extracorporeal Life Support? I sure hope so because that is what this study guide is all about! As you will see below, we have listed out some of the best practice questions on the web today about Extracorporeal Life Support. This information correlates well with Egan’s Chapter 50. Extracorporeal Life Support, or also known as Extracorporeal membrane oxygenation, is a technique for providing cardiac and respiratory support to patients whose who are unable to provide an adequate amount of gas exchange or perfusion via their own organs. It’s a very serious procedure and is definitely something you must be familiar with as a Respiratory Therapist. So let’s go ahead and dive right in! Keep this in mind: If your Respiratory Therapy program is like mine, then you probably use the Egan’s Workbook as well. Don’t get me wrong, it’s a solid workbook that can be helpful at times. The problem is, it takes way too long to look up all the answers, so it tends to be more busywork than anything else. ECMO stands for Extracorporeal membrane oxygenation and is also known as extracorporeal life support. It is a technique for providing prolonged cardiac and respiratory support to patients whose heart and lungs are unable (because they’re too sick) to provide an adequate amount of gas exchange or perfusion to sustain life. 2. What are the 3 types of ECMO? 3. In hypoxic respiratory failure due to any cause, ECLS should be considered when? It should be considered when the risk of mortality is greater than 50%, and is indicated when the risk of mortality is greater than 80%. 4. A 50% mortality rate is associated with a P/F of what? With a P/F of greater than 150 on an FIO2 of greater than 90%. 5. An 80% mortality risk is associated with a P/F of what? Less than 100 on an FIO2 of greater than 90%. 6. ECMO is recommended for MLIS greater than what? 7. Gas flow in an ECMO circuit is referred to as what? 8. The higher the sweep flow, the more? The more CO2 is eliminated. 9. Which form of ECMO involves a complete lung bypass? 10. In order for venovenous ECMO to support oxygenation and CO2 removal, we must have adequate what? 11. Patients with an acute lung injury and preserved cardiac function would be considered for which type of ECMO? 12. Which form of ECMO should be considered for patients with cardiogenic shock, with or without an acute lung injury? 13. What form of ECMO is best indicated for patients with COPD and pre-lung transplant patients? 14. Which group has the best survival rate treated with ECMO? 15. What is the key reason for making ECMO so successful in newborns? Most clinical conditions treated with ECMO in newborns are reversible. 16. What are the different uses of ECMO? It is mostly used for neonatal hypoxemic respiratory failure. Some examples of clinical conditions include: PPHN, MAS, RDS, sepsis, and air leak syndrome. 17. Which of the following strategies is greatly responsible for decreasing the need for ECMO in neonates? 18. Which condition is considered the 1st contraindications for neonatal ECMO? Less than 2 kg of weight. 19. What are the suggested indications for pediatric ECMO? PaO2/FiO2 greater than 75, oxygen index greater than 35, and a pre-ECMO pH less than 7.20. 20. What are the cardiac applications of ECMO? ECPR, CDH, Fulminant myocarditis, and Cardiomyopathy. 21. What statement describes venoarterial ECMO? A cannula is inserted into the right common carotid artery for arterial return. 22. During the administration of venovenous ECMO, the therapist notices that the SvO2 is greater than the SaO2. What is the best explanation of this phenomenon? The native cardiac output has increased. 23. During venovenous ECMO, what effect does the cardiac output have on oxygenation? Changes in cardiac output, either way, will have little influence on the patient’s oxygenation. 24. What are the major advantages of venovenous ECMO? 25. What mechanisms affect the output of venovenous ECMO? The size of the tubing, the rotations per minute, and the tension of the rollers. 26. The therapist should evaluate raceway occlusion because too much roller tension could be associated with which of the following events? 27. What is the advantage of having the centrifugal pump automatically respond to resistances against which it is pumping? It maintains regulated flow through the system. 28. In the gas membrane exchanger, what is one of the limiting factors to the transfer the rate of oxygen across the membrane? The thickness of the blood film between the membrane layers. 29. Because the minimum flow rate required to remove condensation in the gas compartment usually results in excessive elimination of carbon dioxide, what should the respiratory therapist do? Blend sweep gas with a carbogen mixture. 30. What are the most common causes of a decrease in venous return in ECMO? Hypovolemic state, malpositioning of the venous cannula, kinking of the cannula, and shifting of the mediastinum. 31. It is not uncommon for patients undergoing ECMO to experience renal failure. What can be done to enhance renal function? 32. The ECMO specialist has noticed excessive clotting in the circuit despite increased doses of heparin. What is the most feasible explanation for this event? 33. The respiratory therapist in charge of a patient on ECMO is monitoring the ACT every 30 minutes. The last ACT was 100 seconds. What should the therapist suggest at this time? 34. The respiratory therapist in charge of a patient on ECMO has noticed an increase in pre-membrane pressures. What is the most probable explanation? 35. How can membrane malfunction be suspected? Narrowing of the pre-membrane and post-membrane PaCO2. 36. What ventilator settings are typically used in ECMO for respiratory support? A tidal volume of 5-7 ml/kg, PIP 25-25 cm H2O, and a frequency 10-12. 37. What is the ECMO flow that is considered as minimal support? 38. What is considered the most concerning complication of ECMO in a newborn? 39. What are the main uses of ECMO? Neonatal Hypoxemic Respiratory Failure, i.e. Persistent pulmonary HTN of the newborn (PPHN), Meconium aspiration syndrome (MAS), Respiratory distress syndrome (RDS), Sepsis, and Air leak syndromes. 40. What are the uses of ECMO for cardiac applications? Congenital heart disease, fulminant myocarditis or cardiomyopathy, and extracorporeal cardiopulmonary resuscitation (ECPR). 41. What are the modes of Venoarterial ECMO support? Right common carotid & right internal jugular. Central cannulation. 80% of CO supported by ECMO. Nonpulsatile. 42. What are the modes of Venovenous ECMO Support? Blood drained and re-infused back into the venous circulation. Recirculation. The preferred mode of ECMO support in infants & children. 43. What are the types of ECMO systems? Pumps, i.e. Roller pumps and Centrifugal pumps. Artificial Gas Exchange Devices, i.e. Silicone membranes and Microporous membranes, Temp regulation, Circuits & circuit preparation, Cannulas & establishing support, and Hemofiltration. 44. What needs to be monitored when the respiratory therapist is monitoring the circuit function? Water temp, Venous saturation, Circuit integrity, Pre- and post-membrane blood gases, Air bubbles, Hemodynamics, Organ perfusion, Lab tests, and Neurologic assessment. 45. When do you use ECMO? It is most commonly used in neonatal hypoxemic respiratory failure such as: Persistent pulmonary hypertension (PPHN), meconium aspiration syndrome (MAS), RDS, sepsis, congenital diaphragmatic hernia, air leak syndromes, and reversible lung disease. 46. When can ECMO be used? ECMO can be used at greater than 32 weeks gestation and no intraventricular hemorrhage. 47. What are the cardiac applications for ECMO? Congenital heart disease, myocarditis or cardiomyopathy, and extracorporeal cardiopulmonary resuscitation (ECPR). 48. What is the Venoarterial mode of ECMO? A double cannula is inserted into the right common carotid and right internal jugular. It is a surgically placed catheter to aid in the movement of deoxygenated blood through the system and pump oxygenated blood back into the patient. 49. How much of the cardiac output is supported by ECMO? 50. What is the Venovenous mode of ECMO? Blood is drained and re-infused back into the venous circulation through the femoral vein and reinfused to the right side of the heart (right internal jugular). A surgically placed catheter to aid in the movement of deoxygenated blood through the system and pumped oxygenated blood back into the patient. 51. Which mode of ECMO is preferred for support infants and children? 52. What are the types of ECMO systems? Pumps (roller and centrifugal), artificial gas exchange device, temp regulation, circuits, and circuit preparation, cannulas and establishing support, and hemofiltration. 53. What is used for anticoagulation? 54. What should the Respiratory Therapist watch for during ECMO treatment? The water temp, venous sat, circuit integrity, pre and post-membrane blood gas, and air bubbles which could cause a stroke and/or could shut down the pump. 55. What is the main goal of ECMO? The main goal is to discharge the patient without any disability. 56. What is the survival rate for ECMO? Greater than 65% in infants. So there you have it! 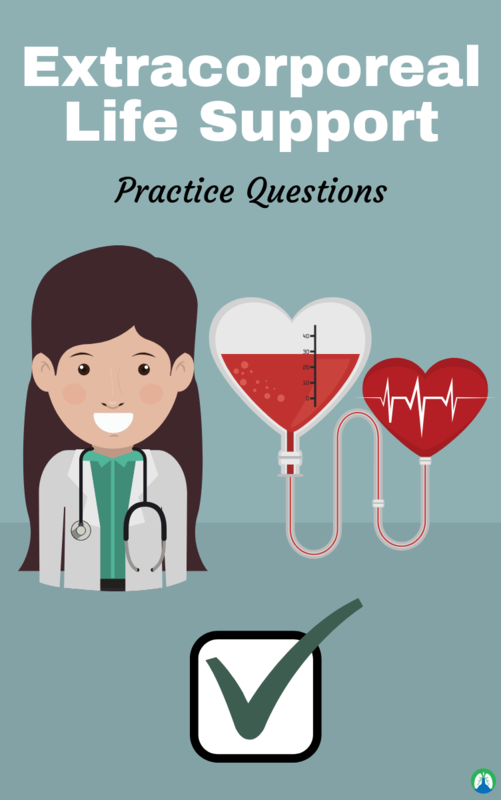 That wraps up our study guide on Extracorporeal Life Support and I hope these practice questions were helpful for you. Make sure you go through this information until times until you fully learn and comprehend it. Thank you so much for reading and as always, breathe easy my friend. 🔒 And don’t forget, if you need help with your Egan’s Workbook, we looked up the answers for you so that you don’t have to. Check out our Workbook Helper to learn more.